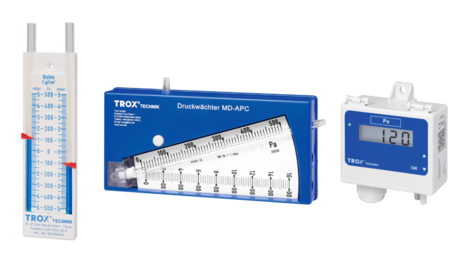 Type MD pressure measuring devices with different measuring ranges for displaying or monitoring the differential pressure of gaseous media. U-tube manometer and analogue pressure monitor are measuring devices with display function. The digital pressure monitor is a monitoring and measuring device with a digital display including LEDs; an optical signal is emitted if the differential pressure exceeds the set limit. Volt-free switch output with changeover contact and transducer output, adjustable, 0 – 10 V DC, 0 – 20 mA or 2 – 10 V DC, 4 – 20 mA, for connection to the central BMS.